Sophomore Elianna Landau, chief of staff of the GW College Democrats, watches as results come in during the group's watch party Tuesday night. After teeing off Tuesday’s midterm election with a basketball game, GW’s top two political student organizations split up to opposite sides of campus to hear election results. The GW College Democrats and College Republicans each hosted their own election watch parties Tuesday in the Smith Center and City View Room of the Elliott School of International Affairs, respectively. Leaders from each group said the results, which gave Democrats control of the House of Representatives and held Republicans’ control of the Senate, set the framework for how they will prepare their organization for the 2020 presidential race. 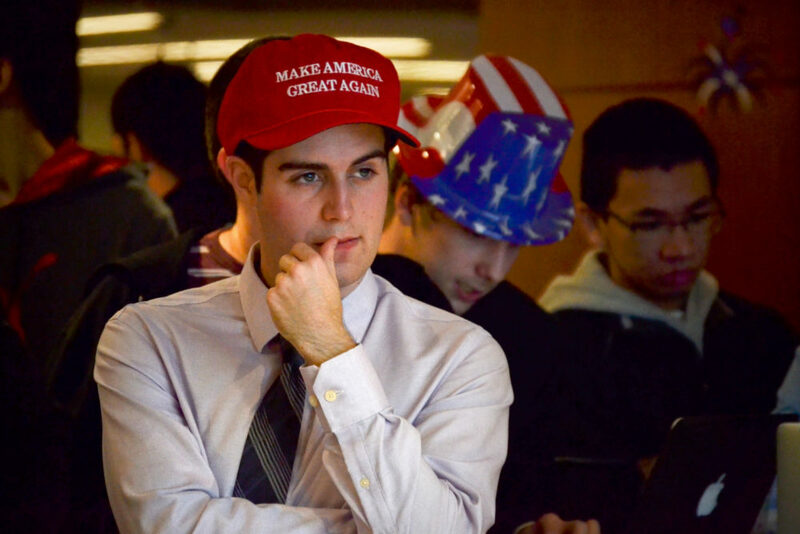 College Republicans celebrated conservative wins on the top floor of the Elliott School. Dozens of members gathered around a projected screen tuned to Fox News as calls were made. The group saw wins in many of the races they campaigned for, but not all, members said. Incumbents Republican Rep. Barbara Comstock and Sen. Leah Vukmir lost their races in Virginia’s 10th congressional district and Wisconsin, respectively. Maryland Governor Larry Hogan saw an easy re-election that prompted chants of “No Blue Wave.” But later in the night, members were more spirited chanting “Mitt, Mitt, Mitt” when former presidential candidate Mitt Romney won the Utah Senate race and celebrating “Ronny D” when Ron DeSantis won Florida’s gubernatorial election. Senior William Frankl watches as results come in for midterm election races Tuesday night. Perry said the House loss gives College Republicans something to fight for leading up to the 2020 presidential election. But he said the outcome of the night might also signal to Republicans that they can’t “alienate sectors of the party” in rural America, where conservatives can pick up wins, he said. Caroline Hakes, the director of public relations for the group, said the night was something many members had been “cautiously optimistic” about because they were unsure if Republicans would be able to hold onto control of the House or Senate. 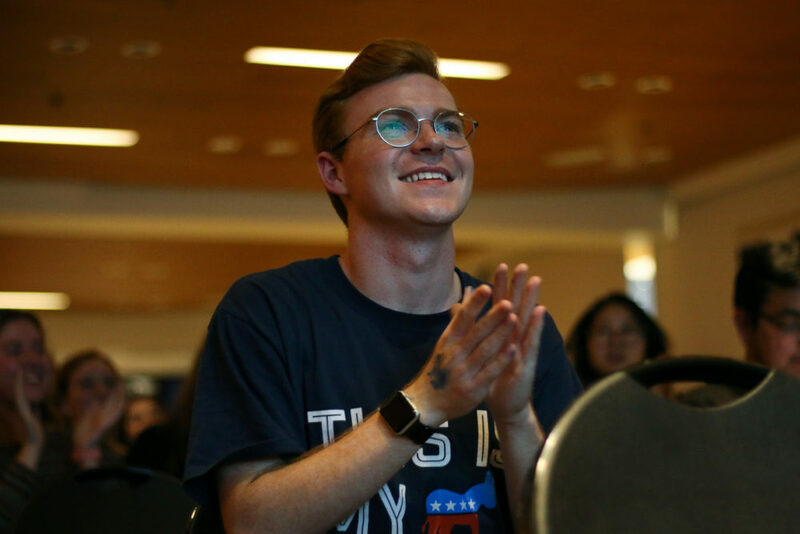 At the College Democrats’ election party, more than 100 attendees sat in the Smith Center clubhouse cheering for Democrats as they picked up more than 20 seats in the House. But students said the Democrats’ failure to take of the Senate was disappointing – but not surprising, since Republicans already had control of both branches prior to the election. Now that Democrats have the House, they will be able to properly implement checks and balances on Republican-dominated branches and could subpoena Trump’s tax returns, members of the group said. Sophomore Alex Benyon, membership director for the GW College Democrats, claps at the group’s watch party Tuesday. “Being able to look across the country and see that Democrats are taking back the house shows that our country is taking a step in the right direction,” Bridget Anzano, the president of the College Democrats, said. Other members of the group said they were closely watching the Texas Senate race, where southern progressive candidate Beto O’Rourke faced incumbent Sen. Ted Cruz. 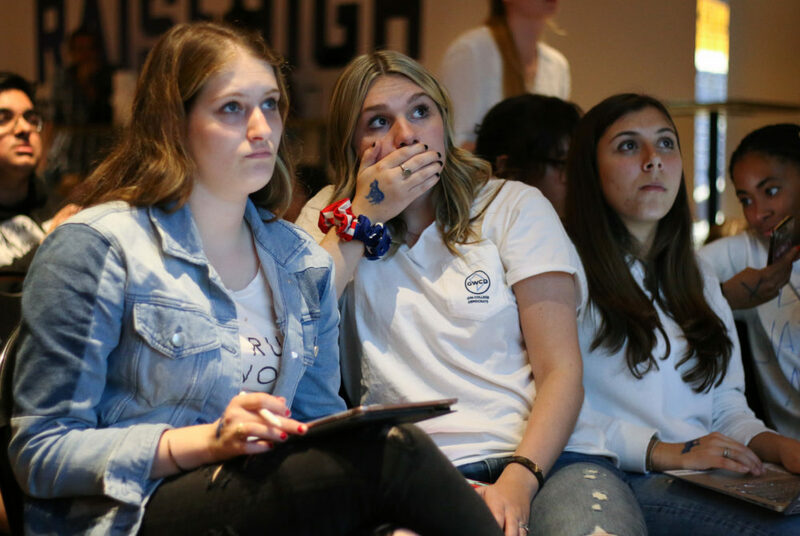 Students booed and cried when the race was called for Cruz. College Democrats also supported candidates Mikie Sherrill from New Jersey’s 11th congressional district and Jennifer Wexton from Virginia’s 10th congressional district, who both won and flipped their respective districts from red to blue. Liz Gonzalez, a member of the events committee for the College Democrats, said increased representation of Democratic candidates in the House will enable an entire congressional body to “fight for democratic rights within our administration” – something she said Democrats could not do when Trump first took office. Luke Briggs, the events and social director for the College Democrats, said regardless of the outcome of the midterm election, Democrats need to continue advocating for their political beliefs to grow their base.